The chicken curry for the Thursday food run. They’re unlikely to admit the fact themselves – Manzoor and Aiysha being two of the most gracious and modest people you could meet – but over the last year and a bit, Barakah Foods have given the South Manchester takeaway industry a little bit of a wake up call. Barakah Foods is offering something different to the takeaways we’ve grown used to: a small menu, fresh and locally sourced ingredients and hand-ground spices, all delicately seasoned and to create food that feels that little bit more wholesome than what we’ve become accustomed to. They’re bringing their own home-cooking to our tables and inviting us to experience family dining as they know it. All of this is prepared on a huge scale from their family home, which from the outside looks like a perfectly inconspicuous South Manchester terrace, but inside there is a very polished and professional operation taking place. As described to Manzoor by one of his customers, it’s said that Barakah Foods has become one of South Manchester’s ‘worst kept secrets’, with word of mouth being largely responsible for their growing loyal customer-base. ‘Barakah’ is an Islamic word meaning ‘blessing’ or ‘blessed’ and I’m sure it is a term that Manzoor and his family feel a real affinity with these days. Now, if Barakah Foods is a familiar name to you, how about Barakah Food Aid? 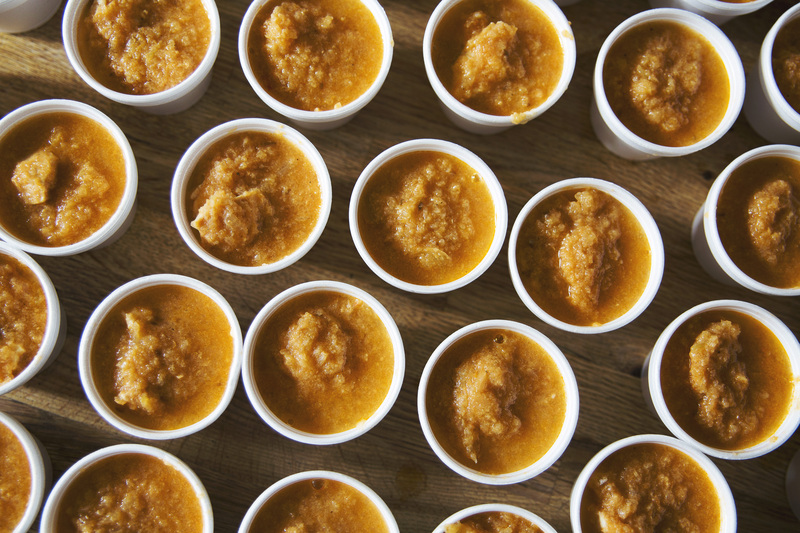 The charitable branch of the Barakah brand has been running for three and a half years (longer than the takeaway) and is serving a large part of the local community behind the scenes (as well as further afield), but it still remains relatively unknown amongst the customers who eat the curries from Barakah. 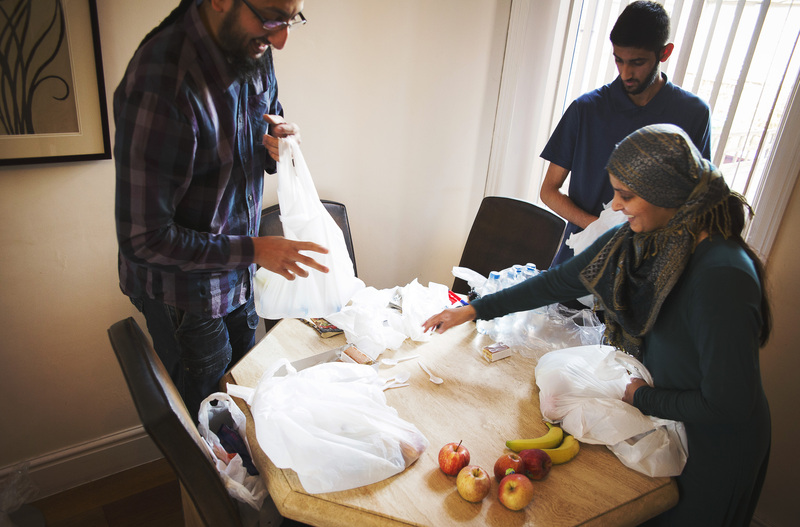 Manzoor and his family help single mums to feed their families, homeless people in hostels and on the street, and they offer food parcels and meals to anyone who seeks their help. They’ve even been known to source carpets and beds for families who need assistance, and will try just about anything to make life easier for those who need it. I met up with Manzoor and Aiysha to discuss Barakah and to see what lies in the future for them. 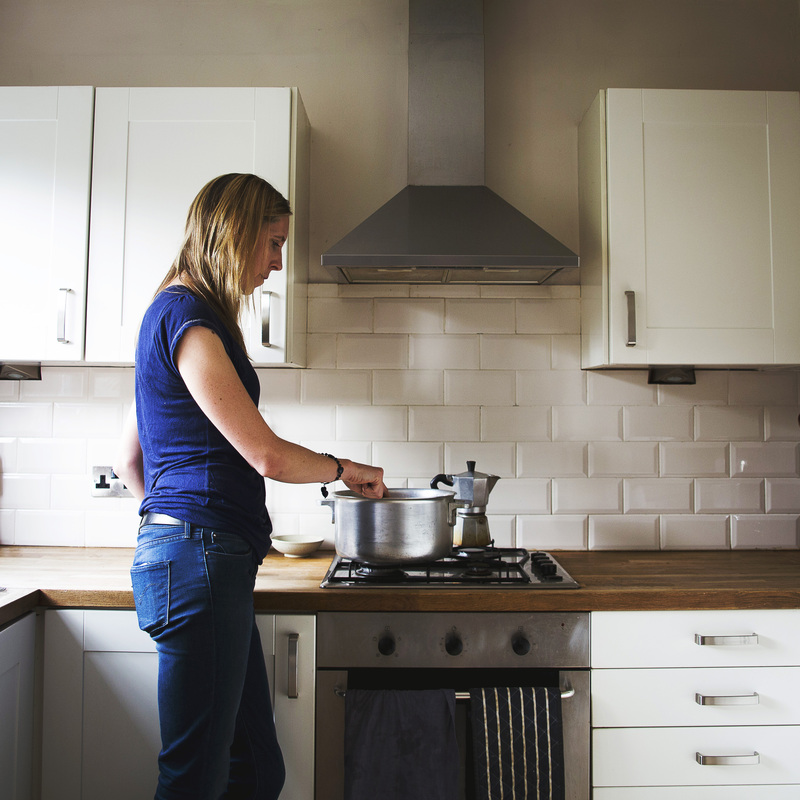 How did you find yourself starting a takeaway from your home? We’d been running Barakah Food Aid for a while and we got so engrossed with the charity side of things that we almost forgot that we needed to put food onto our own table. We got close to the breadline ourselves, believe it or not, and that was when we realised we needed to do something rapidly to change that. We simply thought, ‘Why don’t we try to sell a few curries?’ It literally was that. There was no mention of menus or to what scale we’d attempt to grow the business to, but we now have 3 big fridges in our living room to accommodate all of the food we make. We never in our wildest dreams expected this. We thought we’d sell a handful of curries here and there – enough to get by. It has just gone out of the stratosphere. Who does all of the cooking? Aiysha. She’s the boss. She the magic behind it. It’s her recipes and her cooking. She has a secret recipe Garam Masala which I am actually now ‘in on’ because I help to prepare the food. I’ve been sworn to secrecy though. When it comes to what we cook and how how we make it, we’re doing nothing differently to what we’d usually do when cooking for our family. This is just the way we would cook en masse. We always cook a certain amount on certain days – over the last year and a half we’ve worked out the pattern so we know that there’s different amounts needed on different days. We run out most nights, but customers don’t mind. Instead of ringing us saying, ‘Can I have this, or that?’ they’ll say, ‘Have you got anything left?’ It’s become the norm. Tell me about the dishes you make? The dishes we’ve chosen to cook are what we enjoy and what we like. The menu is small and it’s fresh, home-cooked food. It’s easier to cook and handle that way. We’re not trying to be anything or compete with big restaurants. We weren’t even initially trying to become a takeaway, although somehow we have become a takeaway. One of the dishes we do is a Nihari, but that’s only on a Sunday because it’s a very long and slow cooking process. The preparation isn’t too difficult but it needs to be left for a long time. We couldn’t do that every day. It might end up compromising the quality of the other things and we don’t want to do that. All the curries are all of Pakistani and Indian origin. Things are getting very very busy in terms of the food we make. We’re at the stage of looking for a unit/shop to work from now and we’re looking for someone to invest with us. We don’t want to open a restaurant – we’d just keep it a takeaway because we don’t want to start having to charge crazy prices. We want to be honest with our food. I’d say we need a dragon (with a heart) to invest. We would love the business to grow, but not so that we can purchase a big flashy house or car – it’s so that we can help more people. Initially we wanted to do something that just felt normal and natural to us. We are starstruck by the comments, the feedback. We just can’t believe it. We’re still waiting for somebody like Ashton Kutcher to pop round the corner and say, ‘You’ve been had. It’s all a wind up’. Tell me a bit more about Barakah Food Aid: We started it initially as a way to get food out to the homeless in the city centre. We now go on a weekly basis every Thursday around the streets in town. We drop-off at a shelter in Levenshulme and we drop-off at a wonderful organisation called ‘Freedom from Torture’ too. Manzoor, Aiysha and their son bag up the food for the Thursday food run. So, with the business and the charity, how do you fit everything in? It is very hard. We realise that what we do is very important. Helping people who need support – the cause is very close to our hearts. We consider the charity to be our main job. Barakah Foods has been the thing that has allowed us to make a living, and feed ourselves, and it’s allowed us to fund the Barakah Food Aid project too. When people give us tips with their takeaways, the tips all go into a bucket that then goes back to the charity. The money goes a long way and straight back into the community. Sometimes we wish we could just embrace everybody and give everyone a big hug to say thank you. Our customers don’t realise that they are helping the local community most of the time. We don’t get any official funding. It’s all based on donations and the tips we receive from the business. How do people get referred to Barakah Food Aid? Because we’ve been doing it for a while people now know we’re here. We’ve had single mothers come and knock on our door, hungry. It’s so sad. This is 2014, and we live in Uk, and people have to come and seek food because they can’t afford any. Manchester City council are aware of what we do and we’re on their list of contacts. There’s a local councillor, Angeliki Stogia, who’d been particularly helpful and has really made an effort to assist us. From the council we get referrals, so once they have collected all of the relevant details for their records, they’ll forward people’s phone calls onto our mobile that we have specifically for Barakah Food aid. We take it from there – the persons’ name, address, how many kids they have, what they need. How have the local community reacted to the business and the charity? The neighbours didn’t know too much initially because we’ve been very private with things – especially with the food aid. It’s not about: ‘Oh look at what we’re doing’. We’ve found that the wonderful people in South Manchester have been donating food to us on an epic scale though. From the donations and tips we make food parcels and package them up almost like a full week’s shop. We’ve got a storage unit in Chorlton and a wonderful lady, Fran, has kindly given us her garage space. Fran and another volunteer Afshan take it in turns to get the parcels ready for the weekly distribution. Myself and other volunteers will go out on a Monday and Tuesday to deliver the parcels. Mondays and Tuesdays are the days that we don’t run Barakah Foods – our days off. We really cannot thank our volunteers enough, we regard them as our family – they are so important to us. There are so many people who deserve a mention, probably too many to name individually. I would say there is one incident that has come to mind, during the period last year when there was an attack on a soldier down South. The local police contacted me to say I should avoid doing my deliveries while tensions were high; they felt it was dangerous for me to be out. I didn’t feel like I could not do the food runs so went out as usual. In response, the police escorted our food run to make sure we were safe. They also helped with the deliveries that day. They have been so supportive. Volunteer, Zoe, makes the chicken curry for the food runs. How have you recruited volunteers? Through Barakah Foods mainly. Our customers have become our friends, and then found out what else we do, and following that they’ve offered to volunteer. Without them we couldn’t run Barakah Food Aid with the current level of need. It’s growing every week, every month. It has become a really big thing. We’ve got 3 kids too, the eldest being 21. They help out a lot with the business and the charity. It is a full on family business, we’re all really involved with it. I don’t think people realise the level of need within their local community. Someone might live in a nice house from the outside, but we don’t know their situations behind those closed doors. For all we know, the tears may be flowing. These people don’t know where to go – they’ve been to the council, and the citizens advice. We are the last resort. We don’t ask them to fill forms and we don’t judge. I do believe that the Council are grateful that we are here and that people don’t have to deal with the red tape to access what we offer. In the past we’ve got food out to people in Stretford, Whalley range, Old Trafford, Baguley, and then further. We’ve even sent stuff to Kent, Newcastle, Derby, Kettering. Barakah Food Aid is a community initiative. There’s no hierarchy. Everyone is from a real mixture of backgrounds. We’ve got a wonderful eclectic mix of people helping out with the charity; Muslims, Non-Muslims and non-faith. Through word of mouth we’ve found that lots of different people have wanted to help. Aiysha has taught two other volunteers, Tracy and Zoe to cook the curry too, so on a Thursday they’ll help to cook the chicken curry for the Thursday food run. It’s really nice that they help out. A great thing that’s happened recently is that Manchester Metropolitian University have been in contact to say they’d like to support Barakah Food Aid. They would like to add Barakah Food Aid to the induction at MMU. They would ask all students to donate 1 item each, and they’ve spoken about adding Barakah Food Aid as a module to their coursework. They’ve said they will help with packing, collecting donations, helping to distribute and meet with families and discuss problems and try help with solutions. It’s all amazingly positive, and things like this keep on happening all the time. On the 8th November Barakah Food Aid will be holding a food collection in Chorlton Morrissons should anyone wish to donate.